Saint Louis' Manoa Latu broke up a pass intended for Iolani's Travis Nishioka in the third quarter of yesterday's game. Saint Louis wasn't about to be upset by a Division II team two years in a row. Once considered the dominant football team in the state, the struggling Crusaders put it all together last night in the driving rain at Aloha Stadium with a 35-3 rout of Iolani. The Raiders, who pulled off a surprising victory over the Crusaders late last season, couldn't duplicate the feat. They had no answer for Saint Louis' running game, which churned out 229 yards. "Payback," said Saint Louis linebacker Jared Silva, who had two of four Crusaders interceptions and returned one of them for a 12-yard touchdown and a 28-3 lead early in the third quarter. "We came out fired up." The Saint Louis defense set up two other scores. "Our defense did a tremendous job," said Crusaders coach Delbert Tengan. "Weather (rain and whipping wind) or no weather, we held them to three points and that's a great job. And our offense got us going by scoring on the first three possessions." 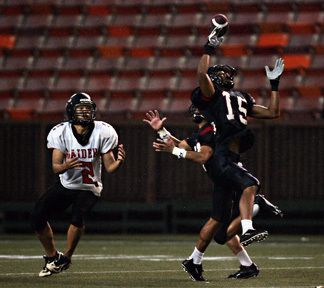 The Crusaders (5-3, 3-2 Interscholastic League of Honolulu) opened the game with a ball-control scoring drive, capped by Keani Nishigaya's 1-yard TD run. Silva's first interception set up Saint Louis' second score, a 2-yard burst by backup quarterback Jeremiah Malosi for a 14-0 lead. After Kody Adams' 25-yard field goal cut the gap to 14-3 for Iolani (6-2, 3-2), Saint Louis stormed into the end zone again with a 68-yard drive. Shane Ahlo Jr.'s 24-yard sweep set up Cameron Higgins' 19-yard touchdown pass to Cameron Bayne for a 21-3 bulge. "We got outplayed, plain and simple," said Raiders coach Wendell Look, who looked utterly dejected after the loss, especially since his team had such high hopes and ended up losing ground in the race against Kamehameha, Punahou and Saint Louis for the overall ILH title. "We didn't come to play. Saint Louis had to win. Their backs were to the wall and they did a number on us." Allen Pimenta set up the Crusaders' final score in the fourth quarter with the team's fourth interception of Iolani quarterback Kiran Kepo'o and a 78-yard return. Two plays later, Malosi scored his second TD of the game with a 1-yard run. Nishigaya led Saint Louis' multi-pronged ground attack, rushing for 55 yards on 18 carries. Cody Wells added 50 yards on eight carries, and Malosi had 48 yards on nine carries. "We tried to play a ball-control, run-the-clock kind of game," Tengan said. Geordon Hanohano contributed with two sacks for the Crusaders. Iolani linebacker Jon Takamura was all over the field making stops. Aside from his numerous tackles, he had an 11-yard sack of Higgins and a blocked punt. "He's one of the guys you look to make plays," Look said. "But he can't do it all by himself." Raiders running back Mike Hirokawa rushed for 91 yards on 15 carries and caught two passes for 38 yards. StL--Keani Nishigaya 1 run (Matthew Terry kick). StL--Jeremiah Malosi 2 run (Terry kick). StL--Cameron Bayne 19 pass from Cameron Higgins (Terry kick). StL--Jared Silva 12 interception return (Terry kick). StL--Malosi 1 run (Terry kick). RUSHING--Iolani: Mike Hirokawa 15-91, Justin Yamamoto 4-17, Ryan Dung 1-(-10), Kiran Kepoo 3-(-17). Saint Louis: Nishigaya 18-55, Cody Wells 8-50, Malosi 9-48, Shane Ahlo Jr. 3-34, Higgins 5-30, Chase Alcott 5-18, Bayne 1-1, Michael Winter 1-(-2), Devan Essner 3-(-5). PASSING--Iolani: Kepoo 10-29-4-108. Saint Louis: Higgins 4-7-0-50, Malosi 0-1-0-0. RECEIVING--Iolani: Kekai Kealoha 4-31, Hirokawa 2-38, Travis Nishioka 2-20, Blayne Yama 2-19. Saint Louis: Ahlo 2-18, Bayne 1-19, Kuli'a Aiona 1-13. Kam--Jeremiah Dela Pena 1 run (kick failed). Kam--Bryson Vivas 5 run (Kamakana Osorio kick). Kam--Aaron Nichols 49 punt return (Osorio kick). Pun--River Kim 16 pass from Brett Kan (Kim kick). RUSHING--Punahou: Miah Ostrowski 1-7, Colin Viloria 6-6, Kainoa Carlson 5-4, Kan 2-(-20). Kamehameha: Dela Pena 25-81, Vivas 19-74, Justin Saniatan 2-12, Nichols 2-8, Shane Lum 1-1, Kaleo Perez 2-0, Drew Ueno 1-(-9). PASSING--Punahou: Kan 12-38-1-100. Kamehameha: Kahaku Ka'ai 3-8-2-63. RECEIVING--Punahou: Kim 6-52, Ostrowski 3-26, Carlson 1-12, Zac Yamagishi 1-9, Matt Solomona 1-3, Viloria 1-1. Kamehameha: Nichols 2-55, Saniatan 1-8. Wail--Edwin Rubio 20 run (run failed). Kais--Isaac Saffery 37 run (Kyle Niiro kick). Wail--Rubio 11 pass from Caleb Fore (Alvin Foster pass from Fore). Wail--Rubio 15 run (Lanakila Vierra kick). RUSHING--Kaiser: Saffery 18-63, Nick Yuzawa 4-12, Thomas Freeman 4-8, Devin Dela Pena 1-(-8). Waialua: Rubio 5-56, Al. Foster 14-44, Adam Foster 6-24, Fore 11-11, Donovan Matas 2-2, Cody Labra 1-(-3). PASSING--Kaiser: Yuzawa 1-10-0-4. Waialua: Fore 15-25-1-119. RECEIVING--Kaiser: Saffery 1-4. Waialua: Al. Foster 6-49, Rubio 3-37, Ad. Foster 2-20, Labra 2-1, Billy Lamug 1-7, Matas 1-5. Waip--Kelii Aki 47 pass from Gilchrist Fernandez (James Tivao kick). Kalh--Ryan Kephas 25 pass from Cody vonAppen (run failed). Kalh--Matthew Soueira 4 run (run failed). Kalh--Soueira 4 run (Soueira run).